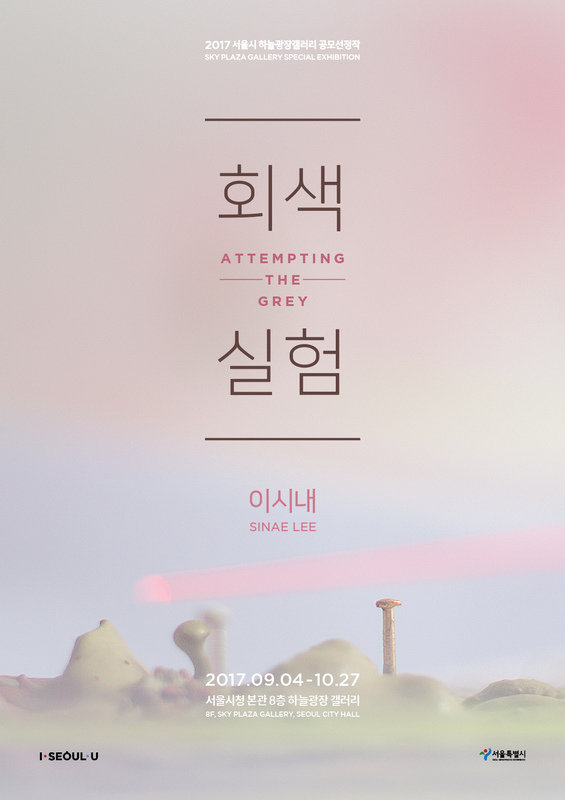 <회색실험>은 현대 도시 풍경의 대부분을 이루는 콘크리트의 주재료인 시멘트의 색다른 가능성을 찾기 위한 실험이다. 콘크리트 구조물은 그 동안 차갑고 삭막하며 몸에 해로운 소재로 치부되어 왔다. 작가는 깃털, 꽃, 과일, 과자, 스티로폼, 실, 플라스틱, 종이 등 일상에서 쉽게 볼 수 있는 소재들과 시멘트를 한데 버무려 새로운 도시 풍경이라는 음식을 요리해내는 과정을 보여준다. 심미성이나 조형성을 고려하지 않은 채, 효율성과 편의성만을 추구하며 급속도로 만들어진 도시의 모습은 마치 찍어낸 듯 획일적으로 모습을 하고 있다. 간혹 중간에 세워진 멋스러운 건물들은 혼자만 잘난 것처럼 주변과 부조화를 이루고 있기도 하다. 또한 도시의 공공 조형물 이를 테면 횡단보도, 보도블록, 휴지통, 가로등의 디자인 양식이 서로 맞지 않거나 무의미하게 자리를 지키고 있는 모습을 우리는 쉽게 찾아볼 수 있다. 작가는 이러한 시각적 부조화를 새로운 시선으로 바라보고 이를 설치 작업으로 구현한다. 이번 전시는 기존의 건축물을 해체하여 콘크리트의 기능 즉, 영구성, 실용성, 효율성을 배제하고 오히려 그의 심미성, 조형성, 주변 소재 및 풍경과의 조화성을 뚜렷하게 드러냄으로써 시멘트의 가능성을 실험하고 콘크리트 건물, 더 나아가 도시 풍경을 새롭게 바라볼 수 있는 계기를 마련한다. “Attempting the Grey” is an exhibition about the “cement” as the main ingredient of the concrete that completes the landscape of modern cities. Concrete-made structures have been regarded as cold, desolate and even harmful to our body. Sinae Lee intends to seek for a new possibility of the cement by mixing cement with feathers, flowers, fruits, cookies, pieces of styrofoam and plastics, threads, papers and other materials that we can easily see in our daily life. And she finally introduces a process of making a new landscape of the city. Not considering esthetic elements, modern cities tended to pursue only effectiveness and convenience. As a result, they get to have cookie-cutter appearances. At some times, eye-catching skyscrapers stand out in the city, not making harmonious landscapes with neighboring buildings. Also we find out all differently designed crosswalks, pavement blocks, trash cans, streetlamps and other public objects. They just are there without any valuable meaning. Lee sees this “cacophoty” in a new look and realizes it into works of installation art. Through this exhibition, Lee takes out main functions of concrete-permanency, practicality and effectiveness, and adds esthetic and harmonious elements to the concrete fragments. It attempts to seek for a new possibility of cement, and provides a chance to have a new perspective of concrete buildings and urban landscape. 어디서도 본 적 없는 나만의 ‘상상 속의 집’을 만들어 보세요. 각자의 개성이 담긴 집들은 마지막에 시멘트로 서로 결합하여 하나의 멋진 작품으로 완성됩니다. How about making your own imaginary house you’ve never seen before? Each of personalized houses will be combined with cement to become a great piece of arts! 이시내 작가는 서울대 동양화과와 영국 글래스고 미술대학원을 졸업했다. 최근 < 어제도 오늘도 아닌 흔적>(갤러리777), < 도시의 쇠락, 그리고 재창조>(신미술관) 등의 개인전을 통해 활발한 작업을 선보이고 있으며 현재 양주시립미술창작스튜디오 입주 작가로 활동 중이다. Sinae Lee studied oriental painting at Seoul National University in Korea, and fine art painting at Glasgow School of Art in UK. She recently had her exhibitions - “Imprinted Marks of Tomorrow” at Gallery 777 and “Urban Decay, And Recreation” at Shin Museum of Art. She is currently working as one of the residing artists of the Yangju City Art Studio.